Actually a meld of two exchange student clusters, the hiking party takes a break to document the idyllic experience. I had the privilege of accompanying nine PAX students from Nevada, two from Utah, and their corresponding community coordinators for scenic hiking and challenging rock scrambling along the Emerald Pools Trail at Zion National Park. 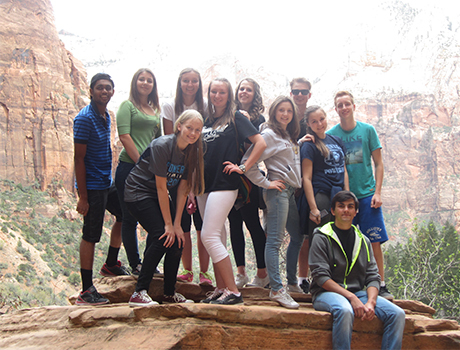 Sadly, the Utah students had to leave early, but the Nevada kids had plenty of time to enjoy this national treasure. After an overnight stay, six students and and their coordinator headed out for a trail ride in the rain. Poor weather spoiled plans for another hike, but everyone was awed by the splendor and majesty of the southern Utah landscape—in the rain, hail, and even snow. It is indeed God’s Country!